Tsardom o Roushie establishes itsel as a new pouer in Europe. Decline o the Swadish Empire an the Pols–Lithuanie Commonweel. Treaty o Nystad: Roushie gains the three dominions Estonia, Livonie an Ingrie as well as pairts o Kexholm an Viborg. Treaties o Stockholm: Pruoushie gains pairts o Swadish Pomerania. Treaty o Frederiksborg: Holstein–Gottorp loses its pairt o the Duchy o Schleswig tae Denmark. 175,000 killt bi faimin, disease an exhaustion. Unkent. Leastweys 75,000 Roushies killt in combat. 14,000–20,000 Poles, Saxons an 8,000 Danes killt in the lairger battles. 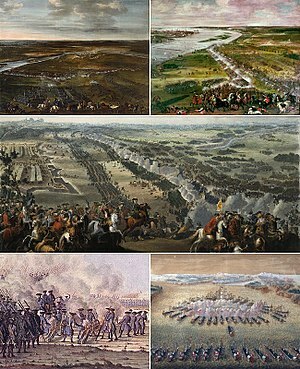 60,000 Danes in tot atween 1709–1719. The Great Northren War (1700–1721) wis a war whaur a coaleetion led bi the Tsardom o Roushie kempit wi the supremacy o the Swadish Empire wi sonse, in Middlins, Northren, an Eastlin Europe. The initial heid anes o the anti-Swadish alliance war Peter the Great o Roushie, Frederick IV o Denmark–Norawa an Augustus II the Strang o Saxony-Poland. Frederick IV an Augustus II war forced oot o the alliance in 1700 an 1706 respectively, but rejyned it in 1709. George I o Brunswick-Lüneburg (Hanover) jyned the coaleetion in 1714 for Hanover an in 1717 for Breetain, an Frederick William I o Brandenburg-Proushie jyned it in 1715.